The Ghouls All Came From Their Humble Abodes. So, if you’ve been following this journal for a year or more, you probably know that Halloween is a big deal to me and my sister. We started buying things to go in the yard as soon as we moved in together - a sound activated creepy bat/ghost/witch/light up eyes in the front bushes, giant spider and cobwebs, light up zombie/skeletons coming out of the ground, tombstones - we just go wild. Then we (along with The BFF) always dress as something scary and do a sort of Larping in the big front windows, acting out things to scare the kids who come to our door. We’ve gotten a bit of a reputation in the neighborhood and on a good year, we can get 150 kids. On our best year, we got approx 250. But this year…we aren’t doing it. The tombstones fall over all the time from wind and rain and Sis just didn’t have it in her to set them back up over and over again all month. We didn’t have time to carve pumpkins. I even totally forgot to send out my traditional Halloween cards. Plus, Sis is on a new schedule of four 10hr work-days, to have Wednesdays off to take Mom and myself to appointments, so she won’t be home until 6:30, in costume until 7. And The BFF is working (yay for permanent job!) and can’t come to town on a weekday. I’m sad about the lack of Halloween around here. But I am still dressing up! As Ballerina Batgirl! Which is basically just Batgirl, but in a yellow tutu and with glittery makeup. 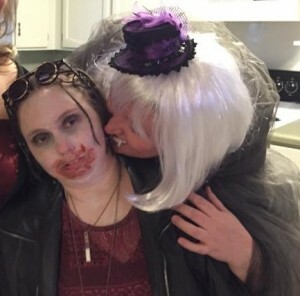 And I have two friends stopping over for dinner and to see my costume - they’ve joined us three years now, and they love to watch our zany Halloween antics. And when she gets home, Sis is putting on her Darth Vader outfit and Winston’s R2D2 outfit and taking him for a walk amongst the trick-or-treats, which will delight them. 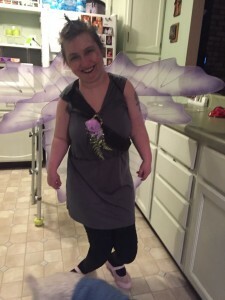 At any rate, since I’m more comfortable posting photos here of myself, I thought I’d share some of my costumes from years past. 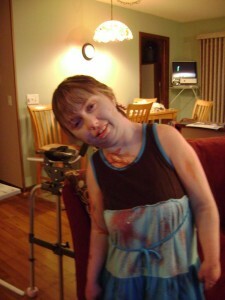 The first year we did the Larping, we did zombies. We stood in the big front windows and acted like we were trying to get out of the house. Sis would throw herself against the window and growl. One little boy dressed as a soldier ‘killed’ her repeatedly with his toy gun. 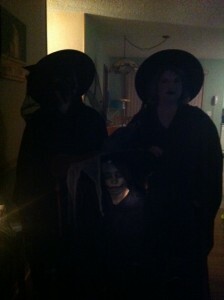 The next year we were Reapers and BFF and I stood in the windows and held very still. Many kids thought we were holograms. Until we started to turn our heads, very, very slowly. One girl, about 9, screamed and ran away at full speed. The next year it rained and BFF had the flu, so Sis and I took what were going to be Scary Witches and turned them into Good Witch outfits. Then the next year, we did Scary Witches. BFF brought a cauldron and fog machine and there was a lot of cackling. 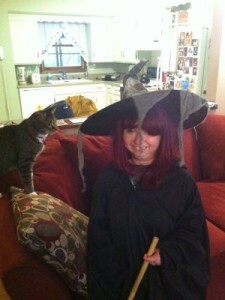 I sat in the rocking chair, positioned so you could see me once BFF opened the door to hand out the candy. I would start rocking very slowly once I knew I was in view and I got a lot of, “What is THAT? !” from the kids. The following year we were Steampunk Vampires. I sat in the front windows with my face in my baby doll’s stomach. Sis would signal me when to lift my head and I would and my mouth was covered in blood and guts and the kids would scream, “She’s eating her baby!”. Also K brought his then-tweenaged son over and wanted a picture of us and right before he clicked it, I turned and tried to rip the kid’s throat out with my vampire teeth. 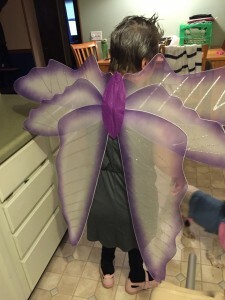 The look on his face clearly says, “I hate my dad’s friends.” Last year we went for Scary Fairies, though they turned out a bit more Victorian Fairy than anything. 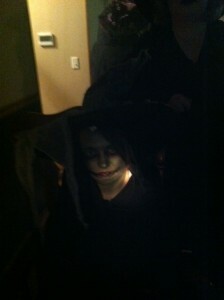 It was a slow year last year, so I just sat in the windows and sort of growled and screeched at kids. Me as a Zombie, 2010 & Me as a Reaper, 2011. 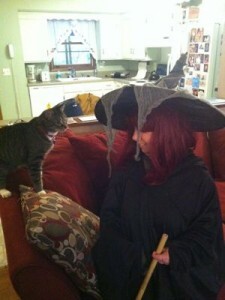 Me as a Good Witch (with Kirk), 2012. Me as a Scary Witch and the Trio of Scary Witches, 2013. 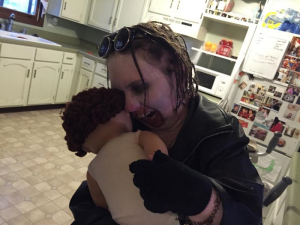 Me as a Steampunk Vampire (getting eaten by my sister and then eating my baby doll), 2014. 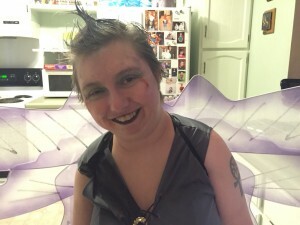 Me as a Scary Fairy, 2015. This year I’ll just politely handout candy like any good ballerina superhero should! *grins* Love 'em all! I hope you all enjoy your more relaxed Halloween this year. Thanks! I've really gotten into costume play, and it was nice this year to get to do something a little less horror-related for a change! The pictures are wonderful! Thanks for sharing a part of your past. We live in a small gated apt complex and don't get over a dozen or so trick or treaters, so we decorate the patio and let it go. Plus my grandson has strep throat, so we are having a movie and popcorn night. It's all good! Hugs! The pictures are wonderful! Thanks for sharing a part of your past. Your welcome! Thank you! I am always proud of my costume play, so it's wonderful to share it here. We live in a small gated apt complex and don't get over a dozen or so trick or treaters, so we decorate the patio and let it go. Plus my grandson has strep throat, so we are having a movie and popcorn night. It's all good! Hugs! For years I didn't celebrate Halloween bc of apartment living (or for a few years bc of living in such a bad neighborhood that no one dared to trick-or-treat around my place) and it was always so sad. Like we did a horror movie watching every year, picked a movie or two, but it wasn't the same as having a reason to decorate and dress up. Love the costumes. Happy Halloween! Thank you! Doing the costume play always taps into my creative side - as I am sure you can imagine being an artist yourself and all - so it feels great to get some kudos for it! I've always been into art and have done some attempts at art myself, but I think I really found my niche when it comes to costume play, especially the makeup side of it. You guys are so awesome with your costumes. I"m sorry that you're not doing a lot costume wise but it still sounds fine. 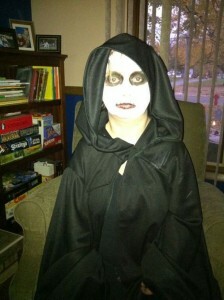 I'm going to do some face make up and volunteer at the library. We get no kids in this area. We got so lucky with our house. When we bought it we certainly weren't thinking, "Will this area get lots of trick-or-treaters? ", but we really do. And even more as our reputation gets around, lol! Thanks! I love costume play so much! LOL It makes me grin so much that you see things on the internet and think of me, hee. But omg, yes, we need a digital projector! That article gave good tips on how to select one. I'll have to start shopping around and see how much I need to save for one. We must have a digital projector for Halloween! We've always wanted to do giant eyes on the front of the garage door. Maybe we could project giant blinking eyes?! I emailed myself the link, lol.